Origin of name  Edgehill was the surname of the plantation's original owners; the name may also reflect a characteristic of the terrain (1). The Edgehill family was the plantation's first owners. The Edgehills were Loyalists durning the Revolutionary War. They returned to England and never returned to the United States (2). The home would house troops during periods of both the Revolutionary War and Civil War (2).
?  Governor John Rutledge acquired Edgehill Plantation, probably through the South Carolina Confiscation Act of 1782. The Rutledge family owned neighboring Sans Souci Plantation which was used as a summer home (2). Edgehill Plantation stayed in the Rutledge family for three generations, passing from Governor Rutledge to his son and then to his grandson (2).
?  The plantation left the Rutledge family when it was acquired by Major LeGrand F. Guerry (2). 1796-1807  Sometime during this period, the original house was destroyed by fire. Major Guerry no longer resided at Edgehill when the fire occurred, but his son, William Capers Guerry, did (2). 1807  General Thomas Sumter owned the property and constructed a new house at Edgehill for his granddaughter, Louisa Sumter, when she married James William Murrell (2). 1835  Edge Hill Academy was located near the plantation and served as a boys' school. Louisa Sumter Murrell was a widow by this time and boarded the headmaster and students from the school at her home. She charged $10.00 per month; the house was not in good repair at this time (2). 1881  Constance Wigfall Simmons purchased Edgehill Plantation after the death of Louisa Sumter Murrell. Constance operated a day school at the plantation's house (2).
?  Richard E. Richardson purchased the plantation from the estate of Constance Wigfall Simmons (2). 1927  Stanley Fletcher Morse purchased Edgehill from Richard E. Richardson (2). 1941  Stanley Fletcher Morse retired to his summer home and sold the plantation to Percy Blair. Blair renovated and enlarged the house (2). 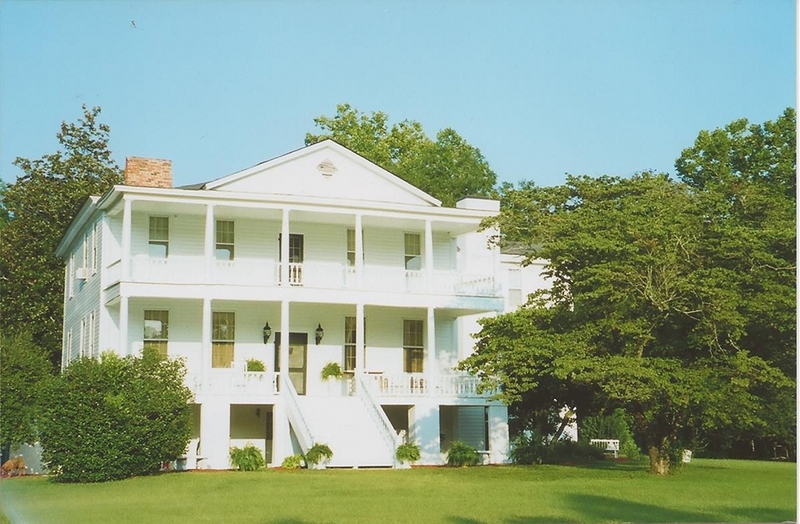 Circa 1987  Major and Mrs. Edward J. Burns purchased Edgehill from Percy Blair. The house was modernized by the Burns. After the death of Mrs. Burns, the house became rental property (1) (2). 2014  Mr. and Mrs. Donald Christian own Edgehill. The Christians are working to restore the house to its original splendor (2). "Edgehill sat on a hill with a north orientation. The house was situated on pillars 10 feet off the ground with 11 steps leading to the porch on the second floor. The house was a typical four-up and four-down configuration, with 2 large verandas, one on both the second and third floors that extended across the width of the house. The roof of each porch was supported by 6 round columns on each level. The front door is flanked by 2 windows on the side. The third story was identical to the second story with windows and a door opening onto the porch. At a later date, both the second and third story porches were screened. Originally, each of the windows in the house were flanked by wood shutters, and the siding on the house was cypress lap siding" (2). Information contributed by owners Donald and Linda Christian and their family friend, Betty Cross.